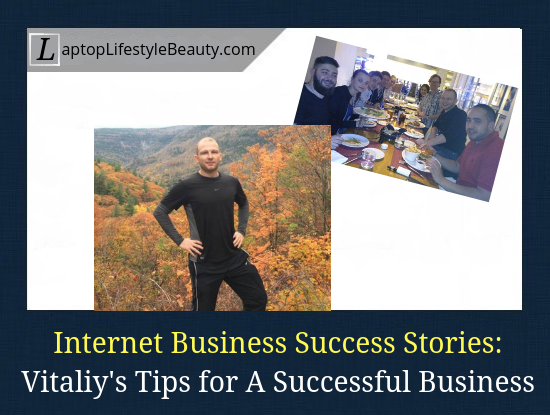 My friend Vitaliy shares his tips for a successful Internet business, which will help you understand how to start a small online business (at home) in 2018 and NOT fail. If you want to succeed online, one thing you need to be able to do is network with others in your field of work. More importantly, you need to learn from their valuable experiences. For me, one of the positive aspects of working online is that I constantly meet awesome people from all over the world. … the list is never-ending. I decided to ask my friend Vitaliy, a successful affiliate marketer, for his tips for building a profitable home-based business. He got into the online business world around 2005 and has gained a lot of knowledge and experience in the make money online field. Based on his online journey, you’ll understand that you too can start your own Internet business (and how to go about it). 1. Vitaliy, can you please tell us a little bit about yourself? I wouldn’t say I’m a normal guy, but I live an interesting life. … and really living a life where I’m in control of what happens when. I enjoy the outdoors and love challenging myself physically out there. 2. How and when did you get into the online business world? I think it was in 2005, at a time when I started college. … that eventually helped me find a great program called Wealthy Affiliate in 2007, after which I stayed with them and still do. They really helped put everything into the right perspective and gave me a comprehensive guide to making my online business. 3. What is your website about? I have several, though, at the time, one of my main ones involves teaching people the same things about online business that I learned and basically also helping them start their own. 4. What is it that drives you to run your own business? See, it’s not uncommon for online businesses to fail. and just not being happy doing it. I know too many people who live that way, that hate it, but still do it and believe there’s nothing else out there. I have always believed that a person should make their own destiny and not have to go through superficial red tape set up in society. 5. What have been some of your failures, and what have you learned from them? Well, failure is no mystery to me. I have had so many that I only remember the worst ones. On my first ever attempt at internet marketing, I wrote and attempted to sell what was basically a novel. Made 2 sales from it, but it was the same person who accidentally got it, thus I was forced to give him back his money for 1 of the copies. When I experienced some good and great success, even hitting six figures off projects that took a little time to set up, over time, they ran out and I actually went broke a few times from this. I think it happened about 2-3 times in a matter of 4-5 years. … until they came back to me 6 months after the fact to basically say “our bad…”. … But what I did learn was that it is important to find some sort of workable formula that can make you money and keep making it. … but without a plan to maintain the money coming in, you’re playing with time and you will go broke. From every failure, know why it happened and in your next project, move to make the success happen again, but omit the issue that caused the failure. In many cases with me, I had projects that were basically making me money because a certain product was popular. Without investing those profits into other projects, and basically sitting around wasting money, I inevitably hit rock bottom when the product stopped being popular. 6. How many hours do you work a day on average? How would you describe your typical day? When my I started, my now online business (post failures), I would work 5-6 hours every single day. … the other 3, I basically train most of the day so I’m too tired when I get home. Most of my week is really a combination of training and online work. 7. What’s the most frustrating part about running your Internet business(es)? When it started, it was really a question of if it would work and if I was doing the right things. There was a long period of many months where I’d write and write content on my site and see traffic that I’d wonder if I was ever going to see success again. … the frustrating thing is to come up with new content ideas as I’ve already written so much about my topic/s that I feel like I’ve covered just about everything. People, for those of you who do online marketing in your future and take on the task of doing product reviews in this niche, beware of the deep hole that is internet marketing products. Most of them are such garbage and setbacks to anyone who tries them that seeing as many of them as I have just made me a bit of a pessimist. 8. And what’s the most positive aspect of running your own business? The freedom without a doubt. I answer to nobody and as I said, I make my own destiny here. It’s great to work at my own pace and know that this type of business is accessible to people who work hard for it. 9. Do you believe there is some sort of pattern or formula to becoming a successful online entrepreneur? Yes, it is finding a passion and a strategy to make that passion make you money. If you do this through online marketing, there’s an extra step in between and that’s learning how to do online marketing, thereby giving you a bridge from the passion side to the success side. And that is through that program I talked about which helped me. Note: Vitaliy is talking about Wealthy Affiliate program. Below is a picture of him rubbing shoulders with Kyle, Carson (founders) and other Superstar Affiliates in Las Vegas Super Affiliate Conference event. He EARNED this fully-paid trip to Vegas! (Here’s how it works). Click On The Image To Learn How Vitaliy Earned A Fully Paid Trip To Vegas! 10. If you could travel back in time, to when you first started this online journey, what advice would you give yourself? I would say, I should have gotten started with Wealthy Affiliate earlier and worked hard from the very beginning, not kept looking for easy ways out. When I had my other projects that were making money, I should have invested it and never stopped working. When you don’t feed the business, the business eventually starves. 11. To what do you most attribute your success? What would you say are the five key elements for starting and running a successful online business? The drive to achieve freedom is really a big motivator for me. As I said before, I never liked to live life under traditional rules that I felt restricted me. I always wanted to have the choice and ability to do what I wanted in life and that gave me motivation. You really need to discover what you like in life, that something that lights your ambition and picks you up in the morning. Even if it’s just a hobby, that’ll work. After finding that, find a way to make money with it. Ask around, research how it can be done. 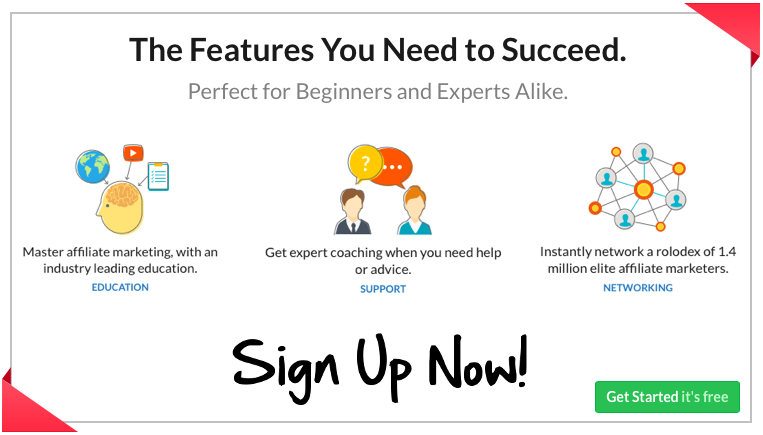 If you have access to places like Wealthy Affiliate, they’ll most certainly show you a way. Get to work and know you have to work hard. Once you have a roadmap set to turn that passion and have it make money, get to work, and put your ambition into it. Easy money is easily lost. Hard earned money fuelled by ambition and passion is the kind of money that is fulfilling to earn. But even when you succeed, don’t become too attached to money, use it as a means to enjoy life and grow your business as well as yourself. Attempt to expand the business by taking extra risks such as exploring new areas of where the business may thrive. In online marketing, we have plenty of places where for example, you can start to get new sources of traffic. Once you have one source down, explore another to expand. Attempt to recreate the business model but in another area. Say your hobby/passion got you to build your business, but now your ambition shifts to a new challenge and new passion, well then use the steps you had work for your first one, but on this one. Thank you Vitaliy for taking your time to answer the questions and for your tips on running a successful online business! If you wish to get to know Vitaliy better and learn about his online projects, then you can follow him on his Facebook page here. Did you enjoy this internet business success story? What questions you wish I have had asked Vitaliy? Need more tips on how to start a small online business at home? Any comments, questions and/or suggestions are welcome in the comments! Thank you for this VERY useful information. I think it is awesome how he participated in this interview. He makes some good points on how things should be done and what we should avoid doing. I will be checking out his FaceBook page as well. I love the key elements. One thing that I am unsure of, is what he said about product reviews. I am not sure what he means. Does he mean the products themselves or the reviews for the products? Hi Lee Ann, good to see you here! I had the absolute pleasure learning more from Vitaliy and actually be able to tell his story. Maybe I should make this a regular thing? What do you think? The way I understand it is that those who are in the make money online niche will learn how much crap products are out there. Pretty much most of the products that you’ll review will be scams… Which might make you a bit of a pessimist. Vitaliy did mention a while ago that he saw very few legit, honest opportunities that actually were around for YEARS. (Wealthy Affiliate being one of them). Thank you for your help. I thought that was what he meant. I definitely agree as I have found plenty of scams during my search for a legit work from home opportunity. Thank you very much for getting back to me so quickly. As for Wealthy Affiliate, I have heard many good things about them. It seems the only bad that I have heard was from those who didn’t make money as quick as they thought they should. We all know that you don’t make money over night. I nearly fell for one very popular MLM program called Digital Altitude a while ago. Luckily, I never paid more than the initial $1 (trial period). I will definitely share my personal story about it. For some reason a lot of people think that just because it’s on the Internet, then making money is easy. REAL business requires REAL work. And it doesn’t matter if it’s a brick-and-mortar business or online one. Personally, I always tell my referrals (or anyone else really) to give their websites at least 6 months. That’s the minimum time Google needs to judge your website, to trust it and to start ranking it high. I totally agree with Vitaliy saying he gets frustrated when he needs fresh content ideas and they are thin on the ground. I am at the place where I am searching forums and looking out for problems I had when starting affiliate marketing. This way I can offer solutions. I also read people’s comments to see how I can ‘repurpose’ my content…and write with intent. Do you ever do that yourself? I read it to the end! Good to see you on my blog… welcome! Forums definitely aren’t dead. I myself find myself browsing forums from time to time, whether to help or just to get inspired/seek some ideas to write about. So, yes, I definitely do that and it’s a good way to NEVER run out of content ideas haha. Hi there Zarina, I am very well aware of Vitaliy and his make money online site. I am very surprised to read he is from NYC – I actually thought he was Russian for some reason. Gotta say, his site with the tips is seriously awesome. Although I have been a member at Wealthy Affiliate for just over a year and consider myself somewhat of a semi-newbie I do learn a lot from his site. His post about how to improve CTA's got me a sweet 20% increase in my CTR! Hey, Derek, good to see you here. Yes, you are right, Vitaliy has a Russian background but he lives in NYC. Given that we live relatively close (I’m in Toronto), we talked about meeting up if we’re ever in each other’s city. Would be awesome meeting fellow online entrepreneurs in person! Well, travel is happening once I recover from my accident/orthopaedic surgery. Hey Zarina! As an entrepreneur, I often find myself scrolling to read stories from successful entrepreneurs. I use their results and “golden nuggets” as fuel to inspire results in my business. This interview was a great read! I really like how you laid it out! It flowed well, you asked great questions, and he gave great tips that I’ll be able to ponder. Thanks for posting this! Apologies for getting back so late, had to deal with my other site and neglected this blog a bit (guilty). It is so inspiring to see successful people making a good living doing something they love in an honest way. There are so many scams and misleading deals online! Affiliate marketing is a real way of making money and if you can make a site based on a personal passion, then there really is no downside. You just need good training as you have explained. Thanks for sharing this interview with Vitaliy. It is inspiring to see he can maintain his business with just 2-3 hours per day now. Hi Jessica! Sorry for the late response. I totally agree with you. Before I joined the online business world, I didn’t realize just how many scams there are! I was pretty lucky, I’ve never been hugely scammed, I mean I remember some sites not delivering but it was so small that I almost forgot about it. Though in 2016, I almost fell for one, called Digital Altitude. Thank God, I decided to stick with Wealthy Affiliate instead! (Because in 2018, DA was announced as a scam company by the FTC). Honestly, the feeling really is amazing when you do something that you really like, have total flexibility and your income only grows. I experienced it first hand. Here’s an article of my 1year old Amazon affiliate site progress. In case you’re interested. I truly hope that like Vitaliy, one day I’ll be able to spend only 2-3 hours per day! A very interesting interview, I found myself in those answers as well. I believe the most important thing is to stay persistent and stay on your course whatever happens. That’s obviously easier said than done but if you manage to do that, it can’t go wrong. Have you yourself ever had that feeling when you just can’t get yourself to work on your website? Welcome to my blog, Dejan! Yeah, staying on your course is definitely easier said than done, especially if this is something you are JUST starting to do! I definitely had that feeling – and most often than not, I gave into that laziness or whatever it was (although last year was a difficult year for me for other reasons and I didn’t have as much energy to work on my website-building and content-creating). However, I try to use the 1-minute approach (just working on something for 1 minute and if it flows, I continue; if I still don’t feel like doing it – I let it go).